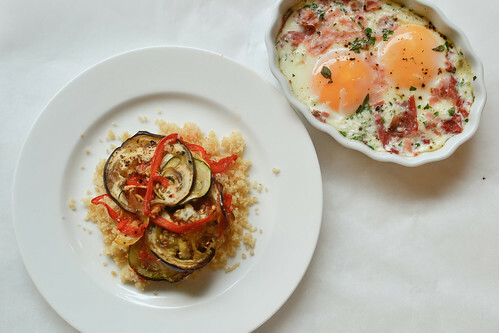 Task me to cook dinner and I will make you my favorite chef’s prime creation, Ratatouille (and baked eggs for extra protein)! That chef is of course none other than Remy, a fictional rat from my favorite Pixar movie, Ratatouille. In the movie, Remy is asked to cook for a famous food critic and out of all the fancy French dishes he is capable of making, he chooses to make Ratatouille…but in his own style! I don’t know too much about French cooking, but I do believe that Ratatouille is traditionally made in a pot, like a vegetable stew. 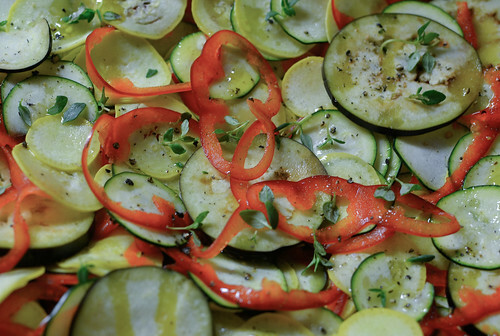 In the movie, Remy slices the vegetables thinly and roasts it in the oven with some herbs and tops it with a sauce. 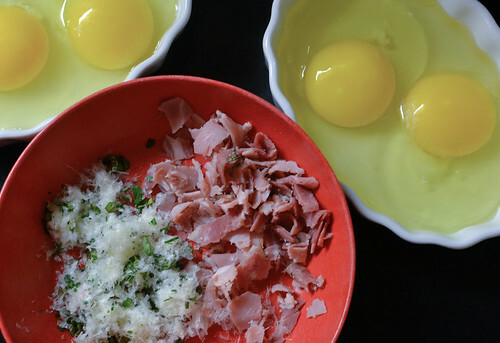 The first time I wanted to recreate the dish, I found this New York times recipe that was supposedly conceptualized by the man/lady who made recipes for the movie. I tried making it during college and it wasn’t too difficult, though it was rather time consuming. This time around I wanted to try a simpler version so I used Smitten Kitchen’s version, which was much easier but still incredibly delicious! The main ingredients are very simple and easy to find. Some vegetables and a sprig of thyme is all you need! I substituted tomato paste mixed with water and a little tomato sauce for tomato puree because I already had them in my pantry. They worked just fine! The key to this recipe is to acquire and utilize a mandoline. Chopping these vegetables thinly is not very fun if you don’t have a sharp knife and above average knife skills. Don’t get too caught up on arranging the vegetables perfectly (I know I did the first time). Just make sure to alternate between each vegetable. Make sure you use salt and pepper generously! 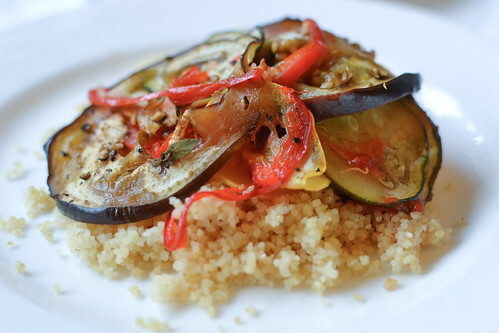 I served the Ratatouille on a bed of whole wheat couscous that I purchased from Trader Joe’s. 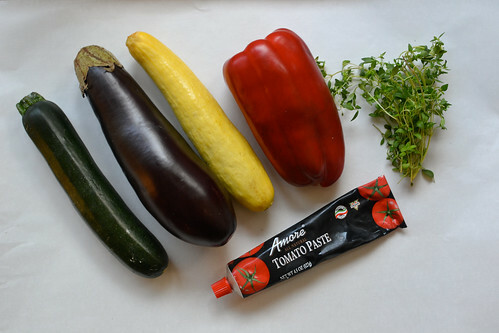 It’s very easy to cook and pairs well with the Ratatouille. Do listen to Smitten Kitchen and top it with goat cheese. It works really well with it! – cute little ramekins to bake them in! It was very easy to make. 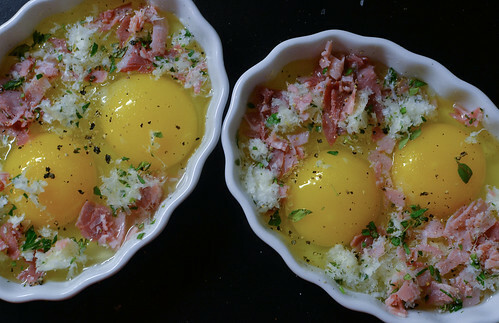 Simply crack the eggs and place them in the ramekin. Top it with the cheese, fresh herbs, sliced up meat and sprinkle some salt and pepper. I held off a bit on the salt because I knew that the cheese and meat would add saltiness to it. Bake in the oven at 350 degrees (same temperature as the Ratatouille) for about 10-12 minutes for a runny egg (which I love!). The deeper the ramekin, the longer it takes to cook and since mine were pretty shallow, they were done in 10 minutes. Voila! 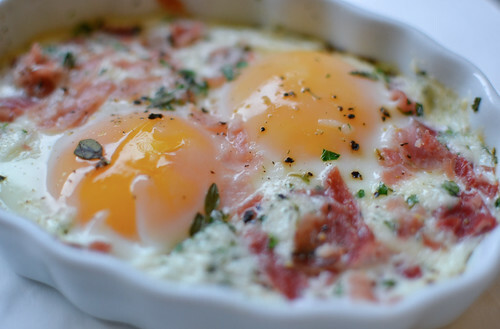 Delicious and sophisticated baked eggs that can be served during any meal. Doesn’t that soft, bright yellow yoke just make you hungry? 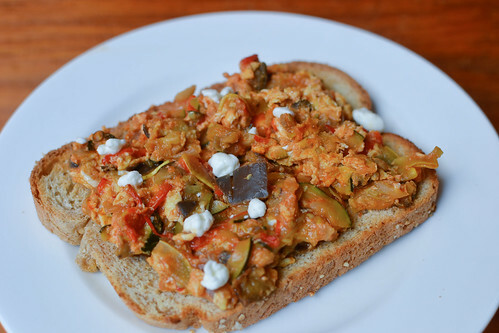 This dinner was good for 3 people with a very small amount of Ratatouille leftover, which I then scrambled with some eggs the next morning for breakfast and topped with goat cheese! I ate it with a crispy whole wheat toast. It was a lovely, hearty breakfast. Two great and pretty healthy meals from one dish. Success! Thanks Remy and Smitten Kitchen! enter your email address to follow this blog and receive notifications of new posts by email or click the RSS button! Why Are You My Eclairity?